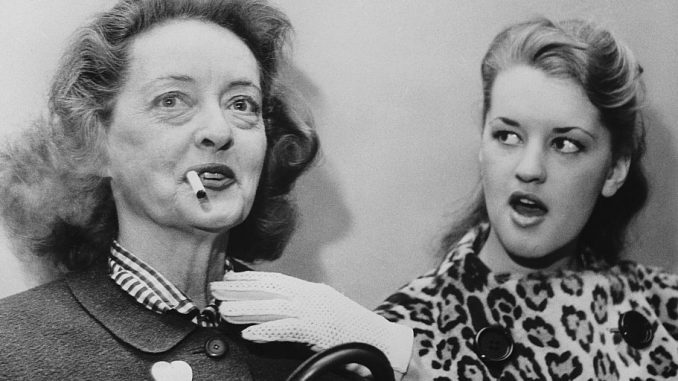 Bette Davis’ eldest daughter claims her famous mother was a practicing witch who put ‘demonic’ curses on her enemies and family. Beloved silver screen legend and icon, Bette Davis, passed away thirty years ago. 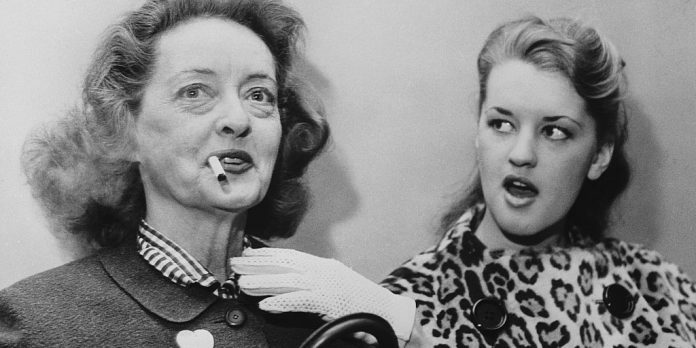 There is currently renewed interest in the star sparked by the new TV show “Feud” on FX featured around the real life tensions between Bette Davis and her arch nemesis co-star Joan Crawford during the filming of 1962’s “What Ever Happened to Baby Jane?” after a decades long feud had already been brewing between the two. Now, Bette Davis’ eldest child, born-again Christian, B.D. Hyman, claims her famous mother was a practicing witch who put ‘demonic’ curses on her enemies and family. Davis’ daughter, B.D. Hyman, is still waging a war against her famous mother in YouTube videos called A Long Day’s Journey Into Light to promote her Christian ministry, she shares her ‘testimony’ with her followers. It includes claims that her mom dabbled in witchcraft, casting spells on her enemies from her bed, and that the star’s ‘demonic’ curse on Hyman and her family led to her grandson’s bipolar diagnosis and her daughter facing terminal cancer. In a 2015 video, Hyman says: ‘[She] would sit on her bed and she had this big metal wastebasket and she would have her secretary get a piece of clothing from someone who had vexed her, crossed her in her view, and she would take this piece of clothing and she would mumble incoherently and she would then set it on fire and hold it over this metal wastebasket, and laugh as it burned and she dropped it into this container. She also claims to have witnessed her mother’s ‘demonic cackling,’ watching her ‘transform into a Satanic figure, [with] a Satanic face, long claws on the end of her hands,’ scraping at the glass of a terrace door during a 1982 trip to her Davis, California home. The claims are just another chapter in Hyman’s bitter relationship with her mom, which she exposed in her 1985 tell-all, My Mother’s Keeper: A Daughter’s Candid Portrait of Her Famous Mother. In the second episode of Feud, which aired on Sunday, viewers get a glimpse of that volatile relationship, which was evident during the 1962 filming of What Ever Happened to Baby Jane? In one scene Davis, played by Susan Sarandon, gets into an argument with a 15-year-old Hyman. After yanking her daughter off the set for ‘posing and laughing in front of the grips like a streetwalker,’ mother and daughter get into a war of words at home. In real life, what Davis was unable to take (or forgive) was Hyman’s toxic 1985 memoir, which was similar to Mommie Dearest – the infamous 1978 tell-all that Crawford’s eldest, Christina, wrote about the screen legend. The portrayal of the actress as a drunk, fading star who staged suicide attempts to manipulate her daughter and was so possessive that she hated her British son-in-law, was so hurtful it severed their relationship for good. At the time of its publication, Davis was a 77-year-old breast cancer survivor who had had several strokes. In a 1987 interview with TV reporter Bryant Gumbel to promote her own memoir, This ‘N That, Davis said: ‘We can hardly have the same close relationship after a book like that is written about you. No, no. It’s just as simple as that. ‘I lost her. I lost her, but that’s that and I say in my book that realizing that she had written this kind of a book about me was as catastrophic as the stroke was to me. Two years later Davis died aged 81 in 1989, after her breast cancer had returned. Mother and daughter never saw each other again or resolved their differences. It’s easy to understand why Davis was hurt by Hyman’s book. The four-time divorcee largely raised her three children alone. She had Hyman with her third husband William Sherry, who walked out when the little girl was still an infant. In addition to Hyman – who is her only natural born child – she adopted two more children (son, Michael, and a daughter Margot) with her All About Eve co-star and fourth husband Gary Merrill. In her memoir, Hyman described witnessing her mother being beaten by her stepfather who also used to shock their servants by drinking a martini for breakfast while standing naked in the kitchen. Davis and Merrill finally divorced in 1960, much to Hyman’s relief. But after that she claimed Davis became more possessive. Bette Davis is widely regarded as one of the greatest actresses in Hollywood history, with more than 100 films, television and theater roles to her name. She was nominated for eleven Academy Awards for Best Actress in her career, winning two, and was the first female president of the Academy of Motion Picture Arts and Sciences.